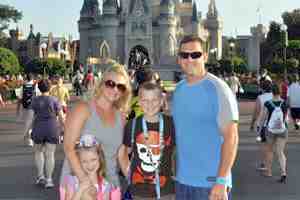 This page accompanies our FastPass+ Overview for Walt Disney World Resort. FastPass+ is Walt Disney World's ride and show reservation system. On this page you will find FastPass+ tips and strategies, how and where to make FastPass+ reservations in Epcot, and FastPass+ rules and restrictions. Ticketed guests can generally make a maximum of THREE initial FastPass+ selections, and more (based on availability) once they have used those they have booked. Epcot has a tiered FastPass+ system, meaning that the park restricts the number of FastPass+ reservations guests can make for its headliner attractions. Of the three FastPass+ selections that can be made in advance for each day, a maximum of ONE can be for an attraction in Group A below. There are 12 attractions at Epcot currently offering FastPass+. The updated plans are very efficient, with the average wait in line under 8 minutes per attraction on most plans. In fact, because the plans are so efficient, we've added Agent P's World Showcase Adventure and other attractions to many of the plans for teens and adults. (We also really like the game.) And some touring plans only use 2 of the 3 FastPass+ reservations you're given each day, which means you have 1 more to revisit a favorite attraction or try a new ride. 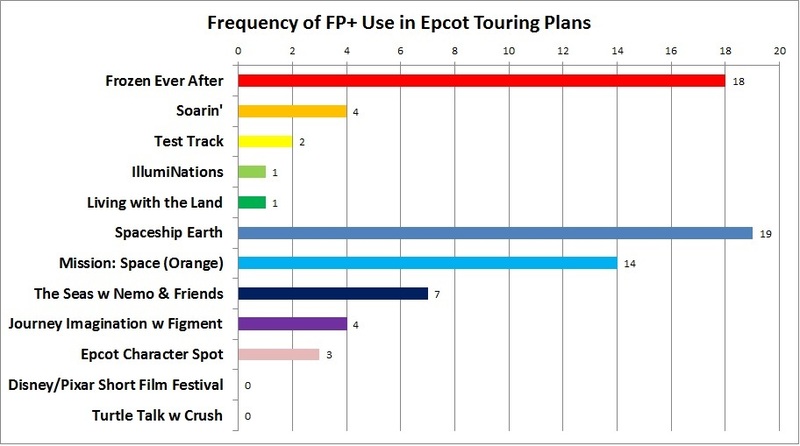 Epcot offers FastPass+ for 12 different experiences, and it was a little surprising to see that FastPass+ was useful in at at least some circumstances in 10 of those 12 of the attractions. Read on for a detailed explanation of why these attractions show up most frequently in our Epcot touring plans. The popular Frozen Ever After boat ride complicates touring Epcot for a couple of reasons. Because it’s in the same FastPass+ tier as Soarin’ and Test Track, you can only obtain one in advance. It’s also not had much day-of FastPass+ availability, because it’s based on a hit film and is one of the few things in Epcot specifically designed for children. Also, its location in World Showcase makes it impractical as a detour while you’re in Future World - any time you save in line will be spent walking instead. For those reasons, we think you’ll save more time by choosing Frozen as an advance FastPass reservation, than Soarin’ or Test Track. With Soarin's new third theater providing 50% more capacity, we think that Test Track is the best attraction to visit once the park opens. Remember that Test Track has a single-rider line that can cut waits by up to 80%, if your party is willing to ride separately. After that, head for Soarin'. Your total wait in line for both attractions should be under 40 minutes on days of average attendance, and under 60 minutes on busier days. For comparison, we estimate the wait at Frozen to be in the 50 to 80-minute range most of the day. When you factor in the backtracking involved in the alternatives, FastPass+ at Frozen seems to make the most sense. We're recommending an afternoon FastPass+ reservation time for Frozen Ever After. If only late evening times are available, take one and simply convert the clockwise tour of World Showcase to a counter-clockwise tour. If you get a FP for Frozen Ever After before 3 PM, do a clockwise tour of World Showcase. We don’t suggest FPs earlier than this because it’ll involve backtracking to Future World from World Showcase. And if no Frozen Fastpasses are available, grab one for Soarin' around 10 AM, and see Test Track first, then Frozen around 11 AM. Regardless of the time at which you obtain your Frozen FastPass, we think it’s unlikely that any day-of Fastpasses would be of much use, because of the backtracking from World Showcase you’d have to do to use them. Finally, we've tested adult touring plan variations that visit Frozen Ever After first thing in the morning, both with and without Fastpass+. In each case, it was impossible to finish the touring plan before the park closed. Why? By the time you've arrived in Future World for Test Track and Soarin', the waits in line were long enough to throw off the rest of the day. If you're going to skip Test Track, however, it might still be feasible to complete a tour of the park. Waits for the Disney/Pixar Short Film Festival and Turtle Talk with Crush are almost always under 10 minutes, so they're not a good use of FastPass+. Similarly, the waits for the non-spinning Mission: SPACE(Green) are almost always lower than the spinning (Orange); the spinning version is more popular and that's what we have in our touring plans. IllumiNations is a must-see, and FastPass+ gets you into a special viewing area for the show, but you still have to arrive a good 30–40 minutes in advance to get a good spot. 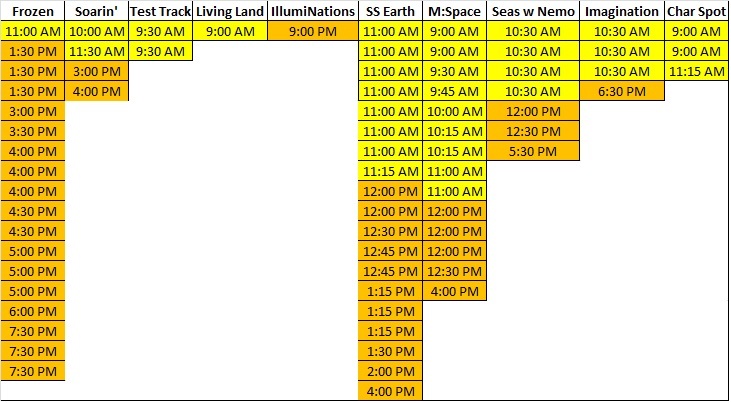 Plus, there are so many other good viewing spots around World Showcase Lagoon that it’s difficult to recommend FastPass+ for IllumiNations; the consequence is an hour-long wait at either Soarin’, Test Track, or Frozen Ever After. The exceptions are if you’re visiting World Showcase solely for dinner and IllumiNations, or if you’ve used your first three FastPass+ reservations and IllumiNations FastPasses are still available. Also note that the average FastPass+ reservation time is before 1 PM in our touring plans. All but one FastPass+ ride is in Future World, and the hike to that one ride - Frozen Ever After in Norway - is too far to be recommended. This, coupled with typical guest arrival patterns at Epcot, means that crowds will be concentrated in Future World through early afternoon. If you can get a FastPass+ reservation for the attractions shown, anywhere near the times listed, the touring plans will work exactly as shown, and your waits in line will be minimized. If you need to choose other FastPass+ attractions or times, our free computer-optimized touring plan software will incorporated those. Select all of the attractions I want to visit during the day, and enter in all of the meals and breaks I want to take. I don’t enter any FastPass+ times at this step, because I first want to see what the Optimizer identifies as the attractions with potentially long waits. Click the “Optimize” button and wait for the touring plan to be optimized. Find the first attraction with a wait over 30 minutes, and see if a FastPass+ reservation is available for that attraction around that time. If I find one, I enter in the FastPass+ time that’s available, and re-optimize the plan. I repeat Step 3 for the two FastPass+ eligible attractions with the highest wait times throughout the day. I re-optimize the plan after each attraction, because saving a bunch of time on one attraction may allow the Optimizer to uncover other ways to save you time throughout the day. I'll also manually re-arrange some of the World Showcase steps in a plan, especially if they're not automatically oriented into a clockwise- or counter-clockwise tour. The folks in our Lines Chat forum are especially helpful in making suggestions for efficient touring plans too. Obtain FastPass+ reservations for Frozen Ever After, Soarin' and Test Track as soon as possible - up to 60 days in advance for FastPass+, or early in the day as possible if you're an off-site guest. Mission: SPACE has two versions (orange and green) with separate wait times. A FastPass+ reservation for Mission: SPACE can be used for either the green or the orange flavor of space travel. World Showcase usually opens later than the rest of Epcot, and it takes crowds a while to migrate from Future World to that part of the park. Test Track has a single rider line. If you do not mind having each member of your party ride in a separate ride vehicle, this can save you time without using FastPass+.